Let’s make some Curved Soup Bowl Hot Pad Cozies! Are you ready! Let’s get our 10 inch square cut! Easy Peasy! Stitch your “X” on your fabric and batting! Making Handmade Holiday Gifts makes me excited for Holidays! Creating Holiday gifts with the Cricut Maker just gives a professional look and cut! Curved edges on the quilted cozy soup bowls softens their look. They are so handy to make a set and stack on top of each other. For the free Curved Soup Bowl Cozies subscribe below! Nest together and stitch on the blue line! Easily create your own DIY Woodland Fox, Fawn or Owl Costume with Cricut! These costumes went together so quickly and inexpensively too! This Fawn DIY Easy Woodland Costume is going to create a smile on your littles face! Can you notice the iron on white spots on the Fawn’s back? Our Fox is just enchanting with the stuffed fur tail, toile skirt and fur vest. All fabric purchased at Joann Fabric Store! Felt colorful flowers accented by white fur make this headpiece endearing. 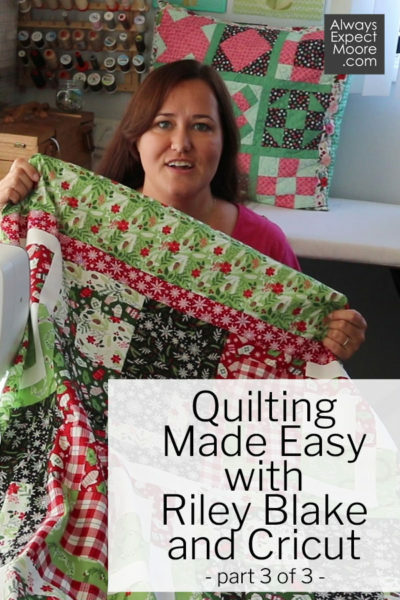 Sew Together & Finish Your Cricut Riley Blake Quilt Kit! Trying to support you in having no UFO’s (Unfinished Projects)! I really want to give you all the tools to complete your quilt! This Tribal Throw Quilt is so COZY that I made myself some hot cocoa and lite the fireplace! It was so cozy that my Cavalier Spaniel, Lady, had to come snuggle too! Let’s use a Riley Blake Cricut Comfort and Joy Quilt Kit to cut out fabric with the Cricut Maker! This Possibilities Riley Blake Quilt Kit with the Comfort and Joy Fabric Collection will make a Tribal Throw Quilt. In this video, I will show you how to prep your fabric and start cutting it out on the Cricut Maker. The Cricut Maker accurately cut out shapes to any quilt blocks. This is especially critical when making a 6 inch square block with 29 pieces. With any cutting error the block will not square up to fit into your quilt. Even my puppy and tortoise can see that this is one squared up block! Thank you Cricut Maker for the accurate cutting! Cricut Maker Possibilities Quilt Kit with Riley Blake Designs Comfort and Joy Fabric is a quilting treat together! Have you seen a quilt kit that can become one of four quilts? Which quilt would you make with the Comfort & Joy fabric? Checkmate Quilt? All Wrapped Up Quilt? Star Burst Quilt? or Big Star Quilt? To see this quilt kit for sale in the Cricut Online Store click here. Farmhouse Window Quilt Tribute to Nancy Zieman with Farmhouse Floral Fabric Collection by Riley Blake Designs. Join in tribute to Nancy Zieman that dedicated her life to sewing and quilting. She passed away in 2017 with her first fabric collection with Riley Blake Designs Farmhouse Floral! Farmhouse Window Quilt Pattern included with the kit. Do you remember watching Sewing with Nancy? What did you learn from Nancy? Quilt Block Design Board Hack! How to make your own Quilt Block Design Boards Tutorial! Quilt Block Design Boards dwindle my hesitation in piecing as the fabric stays put. With more quilty confidence, I can make my quilt blocks faster without second guessing myself or constantly rechecking instructions. This means less seam ripping. AND if you use the 100% Cotton Batting then your design board doubles as a handy surface to press on too! Hey that’s less time running to the ironing board and means accurate quilt blocks! Quilty partay dance! Use Quilt Markers to Sew Your Quilt Blocks Together! These Quilt Markers are the best tool to remember which pattern you want to sew your quilt blocks together. In the Stitches Quilting Free Download you can find 26 Letters and 24 Numbers to keep your blocks and rows organized. Lets Bake Sew Along Quilt Organization is needed to manage all the many pieces and things to do for this baking quilt! At Stitches Quilting, we designed Let’s Bake Sew Along Quilt Custom Organization sheets just for YOU! This way you won’t lose all those adorable pieces of fabric and supplies! So… download the printable and get organized with a 3 ring binder and sheet protectors! This is the layout of the You Are Loved Quilt Pattern. Recognize the half square triangles and full squares in the pattern below. Here is everything that will be included in your quilt kit. Arrange your blocks and rows of squares. Take a photograph on your smart phone. Use the photograph as a reference as you are stitching your blocks into rows at a 1/4 inch seam allowance. Join your rows together by carefully pinning and nesting your seams together. Spring showers bring Mae Flowers and this fabric collection has a bright hopeful spring feel! These fabrics complement each other with all the flowers, patterns and color! Mae Flowers Penny Rose Fabric collection seemed to say make me into a lattice quilt! In fact, Stitches Quilting has the Mae Flower Lattice Spring Quilt handy and available in a quilt kit just for you! Mae Flowers Lattice Spring Quilt Kit starts with a 5 inch square! Below you can get an idea of the pattern of how the quilt is layed out and pieced together. You need 2 yards of Elastic for one set of sheets. Easy Modern Half Square Triangle Quilt for a beginning quilter to learn basic quilting techniques. The Easy Modern Half Square Triangle Quilt is perfect for the experienced quilter wanting to make something colorful, fast while featuring favorite fabrics. 12 Hacks Every Quilter Should Know – Summarized for you!